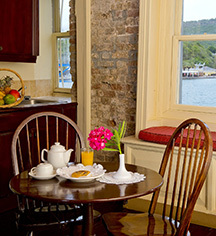 Prepare for a peaceful slumber at the Copper and Lumber Store Historic Inn. Whether opting to stay in the Contemporary Studio or Georgian Suite, guests are guaranteed to experience a once-in-a-lifetime historic getaway. Decked in Georgian-inspired furnishings, guests will feel centuries away from the hustle and bustle of everyday life. For a more modern feel, luxuriate in the Contemporary Studio. The spacious and beautifully furnished guestroom exudes warmth, making guests feel immediately at home. Lounge on premium quality comforters in front of the television or by the low table sipping on freshly brewed coffee and feel at ease. 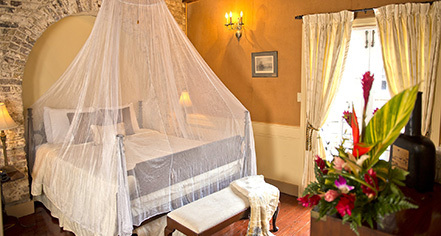 Rooms feature one queen and one twin-size bed. Feel like royalty nestling in the Georgian Studio's premium comforter with a net draping over a luxurious queen-size bed. With its unique Victorian décor, guests are sure to feel centuries away. The soft lighting and romantic ambience makes sure guests will not want to leave this elegant space. Rooms feature one queen and one sofa bed. The Contemporary Suite is a duplex, with a queen-size bed on the main level and another queen-size bed up a small staircase on the upper level under the wooden rafters. The room features ceiling fans, a separate living room, and a kitchenette with plates and glassware. The Georgian Suite is a duplex, with a sofa bed on the main level and a king-size bed up a small staircase on the upper level under the wooden rafters. The room features ceiling fans, a separate living room, and a kitchenette with plates and glassware.